PLEASE SUBMIT IT TO US! Photo: © Copyright taken by Jerry Sintz. bottom picture , the other 2 are the same photo that I cropped . Thought that this may interest you. l UUFOH is interested in obtaining a copy of the original photo in the highest resolution available for further analysis. It does look like a craft but from the scanned pics sent, the resolution is too poor to make any extraterrestrial determination. The original could show details that are impressive. UUFOH obtained a high res version of this photo for analysis by Chad W. with his report (good job!) 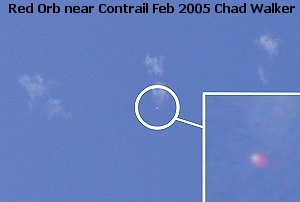 Chad has submitted photos and video of several UFOs. We're gonna have to give Chad his own page! Taken on Nov.12th 2002, while I was on my way down to Blanding Utah on my vacation. I was taking a shot of the scenery and was completely unaware of any object in the sky. 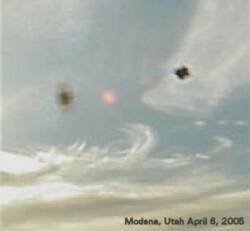 It was not until returning to Orem Utah a week later when my cousin and I were transferring the photos from the camera to a CD that we both noticed the object...We both just looked at each other at the same time and said "NO WAY!" We found no defects in the windshield that would have caused this type of distortion in any of the other photos. Also this is the only photo that the object appears in. 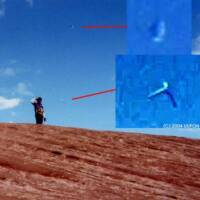 This object is known to be man-made by close examination of the video & still taken. UUFOH is re-opening this case because we recently acquired a copy of the tape shown on the 8/01/02 Channel 5 News broadcast, & find some details of this event interesting. We also would like to find the owner of this craft if possible. l A Full Report (with revealing photos) is now available. 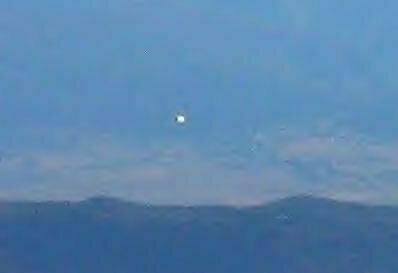 Tommy Woodard took this digital photograph in Provo Canyon, Utah Tuesday shooting still pictures for a possible film location, At the time, he didn't see anything out of the ordinary, but zoom in, he says, and the purple glow of a saucer hovering at an angle above the tree line is seen. 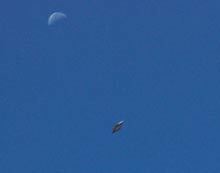 He believes the photo represents an unidentified flying object. Woodard contacted officials at Hill Air Force Base to ask if any planes were flying in the canyon area Tuesday but hasn't heard back yet. 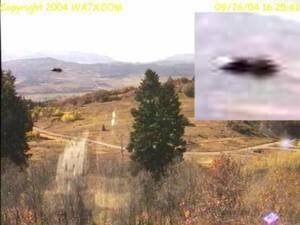 He also turned in the photo to HAFB and now military officials are trying to figure out what it is. 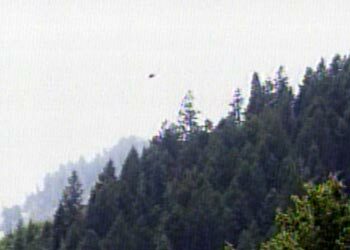 A skeptical reaction to the digital photograph came from a representative of the National UFO Reporting Center in Seattle -- he said thought the sphere looked like a bird. l UUFOH obtained a high res version of Tommy Woodard's digital photograph, for further analysis. Thank you! 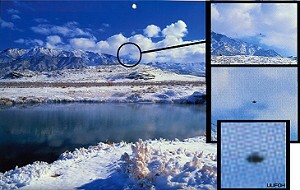 "Taking pictures of the beautiful Utah countryside is part of Tommy Woodard's job with the Utah Film Commission. Recently, though, he captured something on film that's worthy of the silver screen. 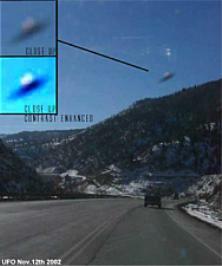 That something just might be a UFO." 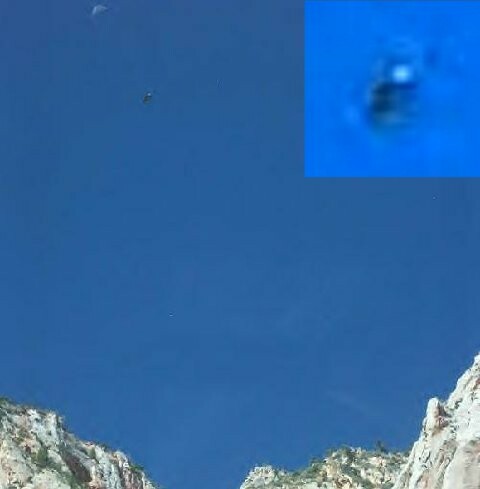 l UFO Photo taken in Provo Canyon! More 2004 Media Coverage! UFO Photographed in Provo Canyon puts Hill Air Force Base on the spot. 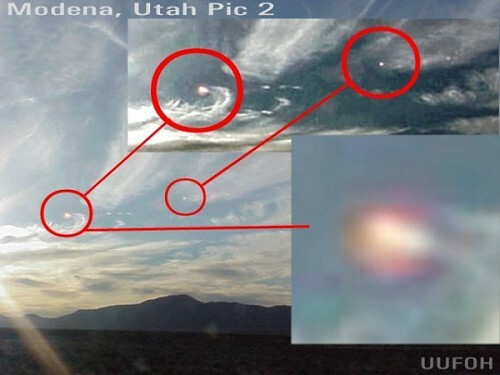 This is the BEST legitimate UFO picture I have ever seen. 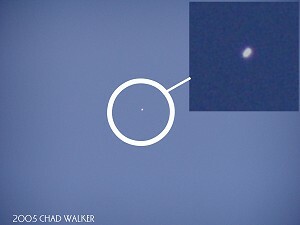 You can clearly make out that this is a saucer. My friend, Dale, who took this picture told me that he didn't even think it was anything other than a bird until he enlarged the picture but it is really something else. 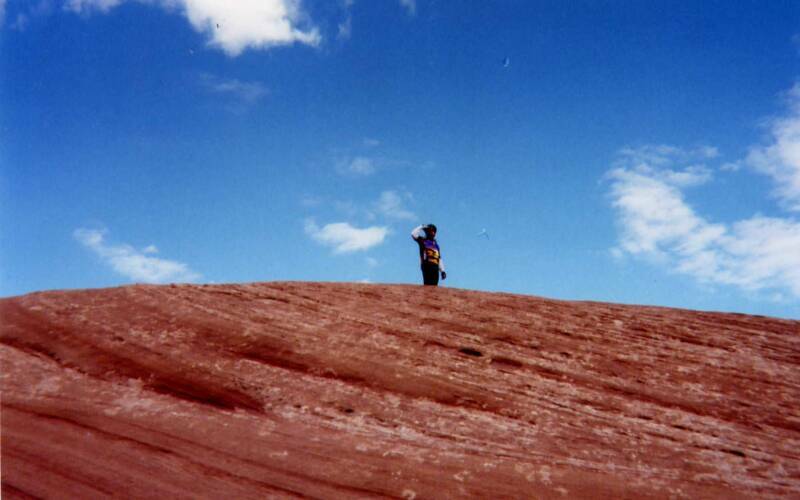 This is a pic of my brother in Moab 2003 November. l UUFOH NOTE: several UUFOH members think this might be a windshield chip, Greg insists that photo was taken while hiking and not from a vehicle. 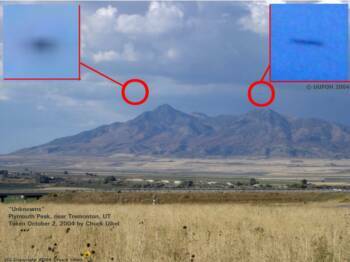 FAIRVIEW, UTAH UFO CAPTURED ON WEBCAM? 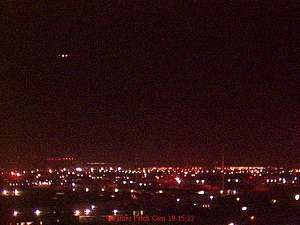 UUFOH was told that a UFO was captured on a local webcam. "on 09/26/07 at 16:25.42 or 4:25 and 42 seconds PM. 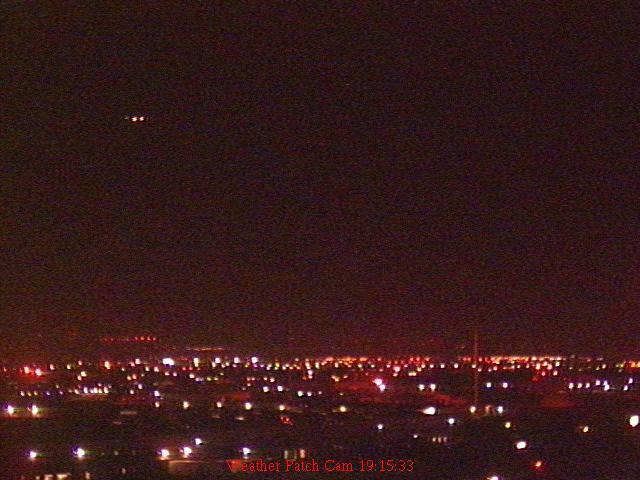 there was a UFO on your web cam. the one that views the valley of Fairview. " D.S. We will look at other frames in the vicinity and see if there is more evidence. G.H. FOX 13 notes that it looks like a bug on the front of the camera. 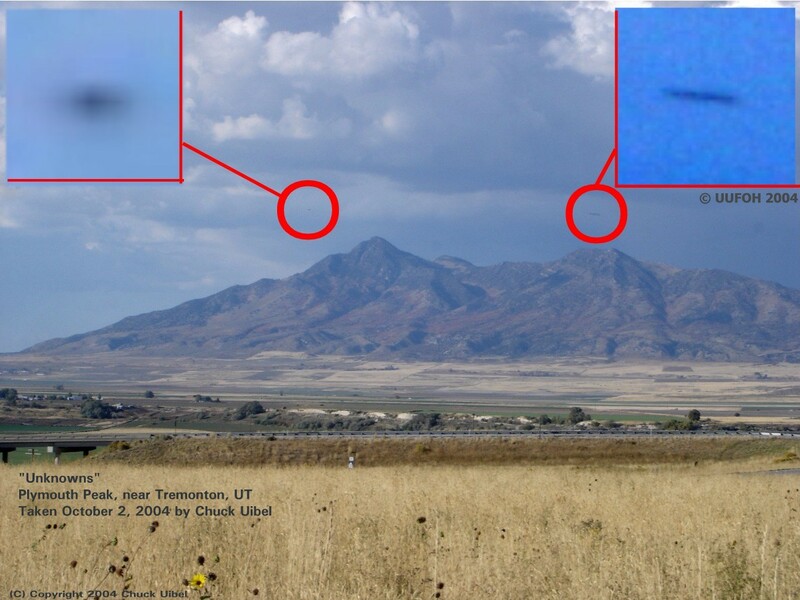 UUFOH was sent this photo of two unknowns over Plymouth Peak. "Hi, these are small version of 5 mp originals Taken October 2, 2004. I took these within less than a minute of each other. 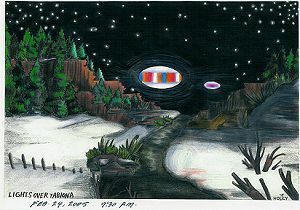 In the close-er up version, there are two new objects in the sky." Lake Powell, Utah 2002 UFO ? 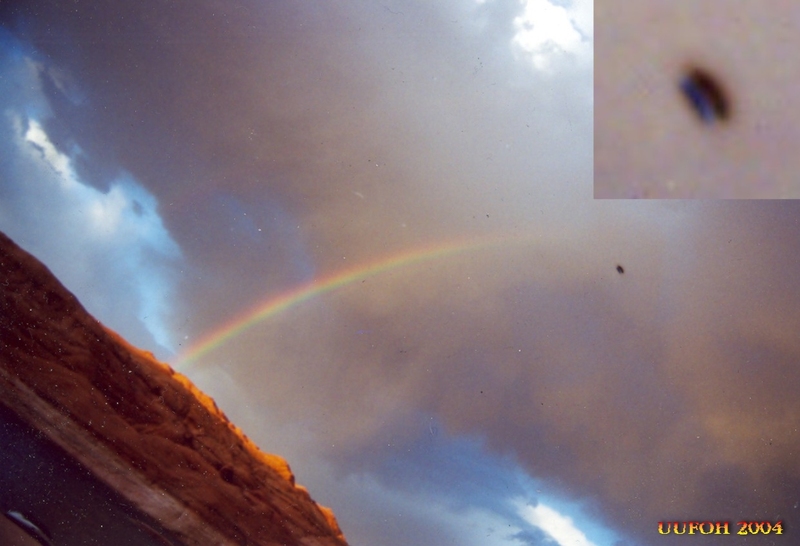 UUFOH was sent this beautiful photo (if centered) of a possible UFO near a rainbow in Lake Powell, Utah. "Hello, Would like you to check this one out. I was just browsing through some pics of Lake Powell 2002 and noticed this speck on the photo. It is on the Neg also. MODENA -- This picture was taken by my neighbor and friend Lydia on April 6, 2005. They were taken with a Sony digital. It was early sunset. We have been watching strange funnel clouds that appear to have these aircraft come down thru the funnel "cloud". We think they are coming thru from another dimension. This has been going on for several months. I am purely an amature in this field and the photo was just lucky! 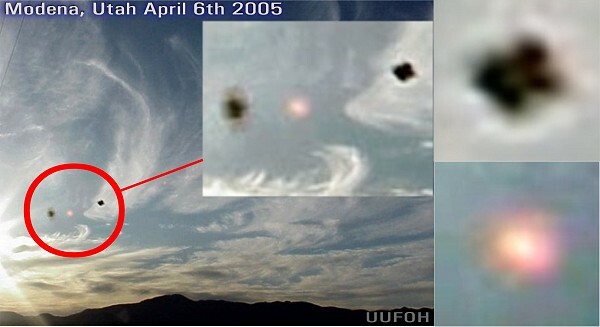 The photo was the one with the two objects on either side of a round sphere and a "funnel cloud". l UUFOH has contacted the witness and has obtained two photos at a higher res version for analysis. The two bottom photos (thumbnails) are the photos UUFOH enhanced and added close ups. A more detailed report might be submitted by the witnesses and posted soon. 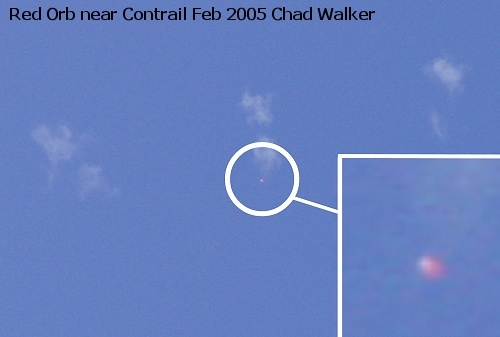 UUFOH: This is a great example of UFO being photographed unknowingly, and an even greater example of someone noticing it long after the photo was taken and published. l UUFOH has been in contact with the witness for some time and has recieved other photos and video for analysis. and is posted on site.
" 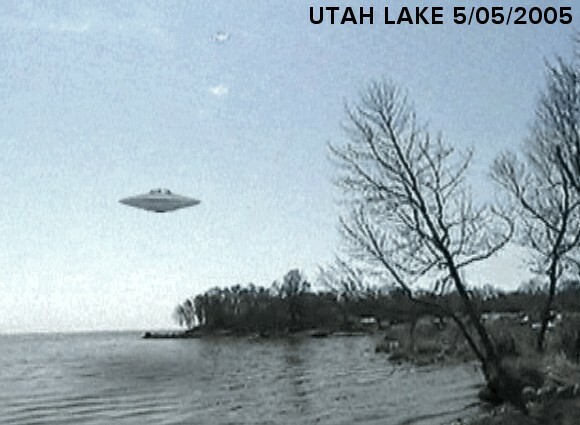 it was taken at 4:12 p.m. on Utah lake. it's a still from a cheap video camera. i have 3 seconds." l UUFOH has contacted the witness and is trying to obtain photos at a higher res version and/or the videotape for analysis. so far no response. 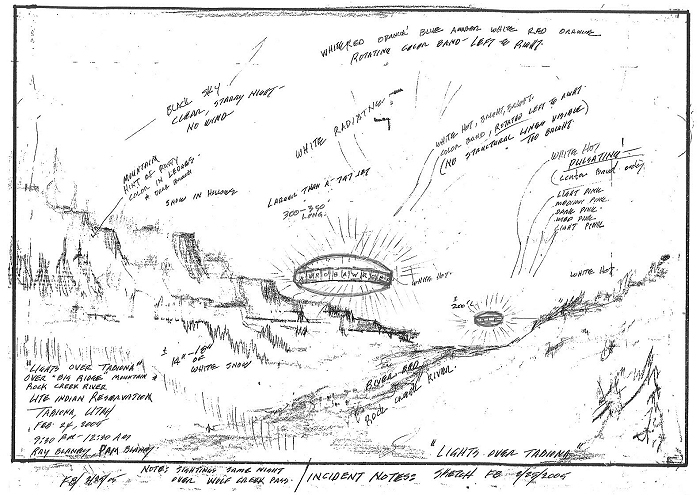 l Message Notes: here are the pictures that guy drew of the UFOs he watched over Tabiona. His brother from texas gave them to my daughter and thought I would pass them along to you. He would like to talk to you or someone about what is happening up there. 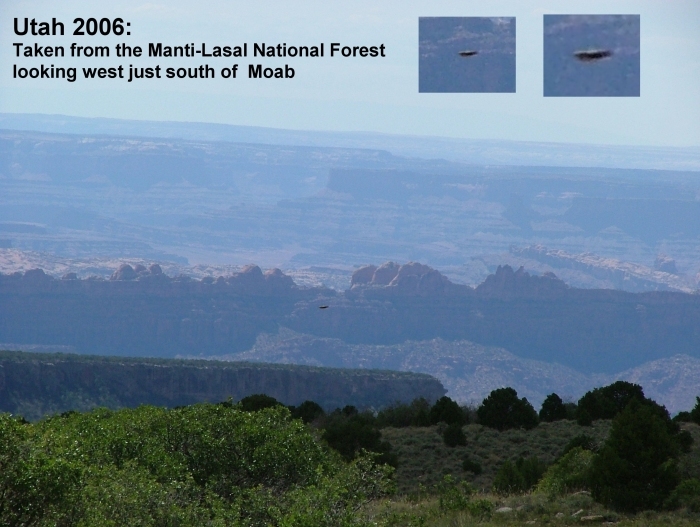 l Filer's Files #45- Shuttle videotapes UFOs, UFO Photographed over Utah, more!